[miau] Take a mystical journey full of adventure with an elusive unicorn that can lead you to a huge cash jackpot. 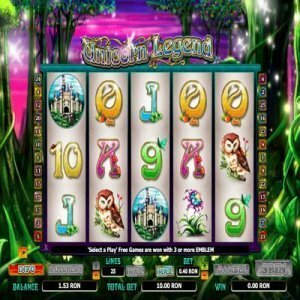 Unicorn Legend Slots is full of magical wonder and enchantment offering free game features as well as gamble features that provide lots of chances to win. You will also find exciting bonus game and free spins to increase your chances of winning. This five-reel 25 pay-line slot adventure offers cool graphic of a fantasy land full of unicorns, maids, castles and other symbols. You have many opportunities to find winning lines and valuable bonuses. When you start to play all lines are selected. If you want to play only select lines, the ones you select will light up. Your bet per line is also set on all 25 lines but you can choose to increase or decrease the bet per line. You can also choose to bet the maximum number of lines and the maximum bet. Your payout is the prize multiplied by the bet per line. The scattered payout is the prize multiplied by the total bet. Your wins can be noted by highlighted pay-lines and animated symbols. Your symbol lights up when you have a scatter win. Your Free Game win amount is shown as a message below the reels. You will see the winnings for each line at the end of that line and the total amount won at the bottom of the reels. Any Line wins and Scatter wins are paid in normal spins. When 3 or more scattered Emblem symbols appear anywhere on the reels, the Free Game Feature is triggered. You will be taken to a screen that prompts you to “Select a Play” and you can choose 20, 15, or 10 Free Games. With 20 Free Games, the Unicorn is multiplied by 2, 3, or 4, randomly. With 15 Free Games, the Unicorn is multiplied by 4, 5, or 6, randomly. With 10 Free Games, the Unicorn is multiplied by 6, 8, or 12, randomly. While playing you free games, the Free Game Feature can be re-triggered, noted by graphic display, which will be moved up by the game title as a reminder. You will keep playing your current free games until completed, you, then, will be taken back to the “Select a Play” screen again to choose how many free games you want. The base game win, scatter wins and total win can be used for the Gamble Feature. If you select the Gamble Feature, clicking on the Take Win button before starting to gamble will return you to the base game and the Gamble button will be disabled. You can repeat or change your bet and you game balance can be viewed under “Credit”. You can also set Auto Spin options. Let the Unicorn take you on a winning journey to the land of riches. Enjoy the endless possibilities of making winning choices.